World renowned electronics manufacturer Philips has announced today that it will be exclusively launching its “Hue” web-enabled lighting system through the Apple Store starting from tomorrow. The new system from Philips offers energy saving LED lights that can replace your existing bulbs and they can then be controlled from your iPhone or iPad. Building on its innovation capabilities, today Philips unveils hue, the world’s smartest web-enabled LED home lighting system. Philips hue signals a new era in home lighting both in the way we think about and experience light in our homes. It allows you to create and control the light using your smartphone or tablet. Bringing endless possibilities to help you get creative and help you personalize your lighting to suit yours and your family’s lifestyle, Philips hue is available exclusively from Apple stores from 30th October. A starter pack includes three bulbs that simply screw into your existing lamps, and a bridge that you plug into your home Wi-Fi router. Simply download the hue app to start experiencing light in a completely new way. Once you have your system installed you can fire up the iPhone or iPad app and customize the lighting in your home to your hearts content. You can change the color of the light, control and monitor lighting of your home from anywhere in the world, set up timers and even use light as your wake up call. The Philips Hue certainly looks like a very nice way to add some home lighting automation to your home. If you want to get hold of some, you can buy them exclusively through the Apple Store starting October 30th. They will come in a starter kit which includes three bulbs and the interface that needs to be connected to your home router; this starter kit will cost $199. Once you have the starter kit, you can add in extra bulbs at a cost of $59 per bulb. The system can currently support a maximum of 50 bulbs. 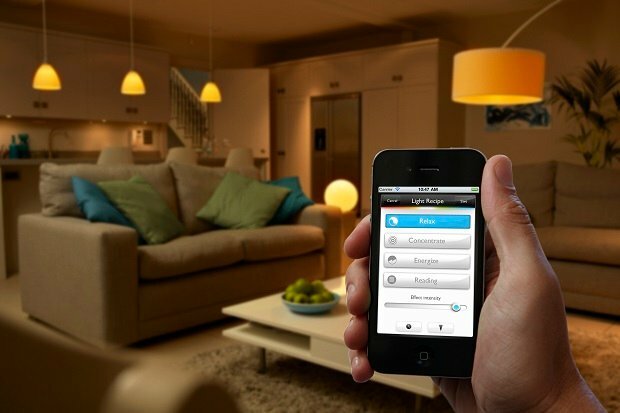 Can you see yourself fitting this sort of lighting automation system in your home? hue - Master Video from Philips Color Kinetics on Vimeo.